Cozy 1 bedroom apartment in the center of Los Cristianos. Close to shops, restaurants, bars, supermarkets and Las Vistas beach. 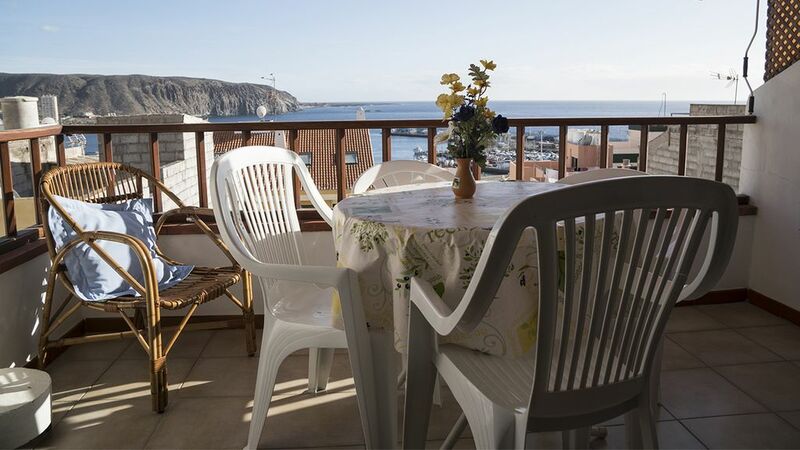 Large balcony with panoramic sea views fully equipped to spend a pleasant stay. It has folding awning, side table and chairs. Kitchen with folding table to enjoy the space. Sofa bed comfortable for 2 people and bedroom with 2 single beds. Wifi in the apartment and around the pool. The apartment was really lovely would go back again.It had everything you needed the lady who meet us was very nice and friendly. Nous avons passé un très agréable séjour dans cet appartement. Nous y avons apprécié la tranquilité , le confort de la literie, l'équipement, la propreté , le petit déjeuner sur la terrasse. Un point de chute à recommander pour visiter Tenerife. The host was lovely and professional. The house was clean, comfortble and there was everything we needed. The house is situated in a good place and the price was adeguate. A lovely clean apartment with a great view. We came for a relaxation and recharging the batteries after hard work, and also this was our retirement treat. Everything was just the way we were hoping to have. The apartment was clean, well equipped, the view was exceptional and we were able to walk everywhere. I would like to give a special thanks for the welcoming reception on our arrival.